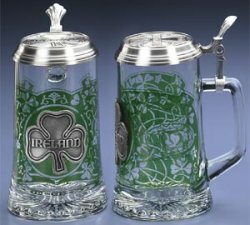 This stein is a salute to all of Irish descent. It is decorated with a translucent wrap-around emerald motif featuring numerous shamrocks. The claddaugh symbol is on both the left and right side of the stein. A pewter shamrock medallion appears opposite the handle. The pewter lid is also adorned with a relief pewter shamrock motif.